What is one of the most over-used and prescribed drugs in America? You might immediately think of antibiotics. Those are definitely over-prescribed. 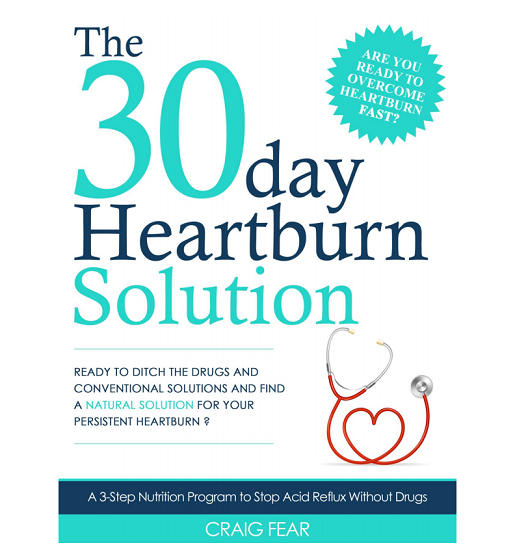 However, the medications Craig Fear, NTP (Nutritional Therapy Practitioner) refers to in his new book, The 30-Day Heartburn Solution are anti-acid medications such as TUMS, Rolaids, and prescription medications including Prilosec and Zantac for heartburn and acid reflux. One of the most pervasive health myths is that the cause of heartburn is too much acid produced in the stomach. In this book, you’ll read why this is an idea whose time has come and gone. You may also be surprised to learn that contrary to popular belief, there is a connection between continued use of heartburn medications and nutritional deficiencies, bone loss, and further digestive problems! I like the assertion that the symptom of heartburn after eating a meal is an example of cause and effect. Remove the cause of the heartburn, and you will have a solution! In this case, Craig emphasizes the nutritional value of our diets in resolving heartburn and acid reflux. In some cases, other holistic interventions may be warranted. But the good news is, in many instances, dietary changes are all it takes! If you are one of the many people who have taken drugs or over-the-counter medications for chronic heartburn or acid reflux, I really think you could benefit from reading this book! You’ll learn about the science and connection between not only processed foods and heartburn or acid-reflux, but also the missing components of important nutrients that are largely missing from our modern diets. Vitamin A deficiency, for example, is linked to gut disease. Dr. Natasha Campbell McBride, a neurosurgeon who has conducted a great deal of research in this area on the relationship between gut and brain health, has written about this in her book Gut and Psychology Syndrome, and various papers and other literature. Craig provides a 3-Step Plan which involves dietary changes. These changes may not be what you expect as the conventional dietary change approach is quite different and might recommend stress reduction, eating low-fat foods, and eating less. You’ll also read in a subsequent chapter not just how to resolve heartburn, but why this book is a foundation is a means for optimizing overall health. In my opinion, any recommendation for solving a specific health problem ought to also include how the rest of the body is affected. I am in complete agreement with Craig that unlike the conventional view, maintaining optimal health requires a holistic approach rather than symptom management. So, I give a round of applause to the author for making this critical point very clear in this book. Finally, Craig provides meal plan ideas, recipes, and a few important foods or supplements that will help you achieve not only a resolution for digestive issues such as heartburn and acid reflux, but a solid foundation for overall wellness. Another extremely important fact you’ll uncover is that most restaurants and other businesses selling food do not offer real food to support optimal health. The reader is not only encouraged to become more comfortable with cooking at home and meal preparation, but is provided with simple tools and solutions to get the job done. I believe you will come away with a better understanding as to why eating out, ordering take out, and preparing frozen meals are not ideal means to achieving health after reading this book. If you have spent any length of time propping yourself up at night in bed so you can sleep or taking pills at the first onset of heartburn, I highly recommend The 30-Day Heartburn Solution! I would also like to mention that I personally know a number of people, including my own husband, who have implemented the principles in this book and successfully eliminated these bothersome issues. Visit Craig’s web site, Fearless Eating for more information on eating, living, and being well.